But Waltz with Bashir has been altered beyond recognition by the war in Gaza. While of course the film screened remains the same, our eyes and minds cannot but color the viewing with news and images from Gaza. 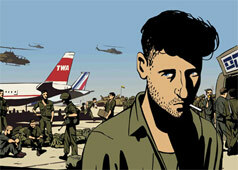 Similarly, watching the news today after having seen Waltz with Bashir is somewhat surreal. It feels like we have fallen from animation into reality. Is the Gaza Operation another limited incursion that in reality aims for regime change? Are we culpable innocents, as some might say the film suggests? Is the next mass rally about to fill Rabin Square? Or are all comparisons between 1982 and today, inappropriate, problematic, and unhelpful? How can we watch Waltz with Bashir?